David Ben’s controversial take on E.S. Andrews and one of magic’s most controversial books. Leaving aside the battles over its mysterious author’s identity, no other book in magic has been the subject of greater controversy than The Expert at the Card Table. When a young David Verner showed up in New York City, the book was almost universally regarded as an excessively technical, insignificant text. However, after the Canadian wizard used Erdnasian approaches to befuddle every magician in the metropolis, The Expert became recognized as a book of biblical proportions. Vernon’s Talmudic annotations were later collected in the book of Revelations, which spurred another devotee and one critic — Darwin Ortiz and Edward Marlo — to add their own marginalia. Depending on the reader, these texts are held to be sacred or blasphemous. Indeed, we live in a world where a difference of opinion on Erdnase is enough to turn loved ones into enemies. 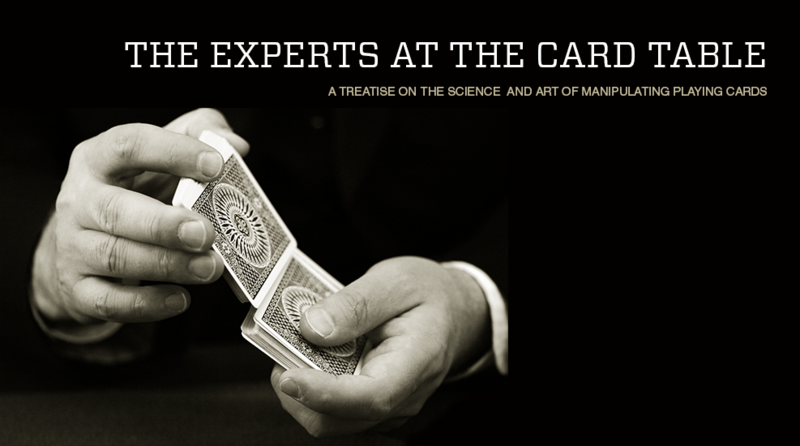 All of that makes David Ben’s new project, The Experts at the Card Table, a daring one. No mere annotation, The Experts gives Erdnase a complete overhaul. The text has been rearranged and, in some instances, completely redacted. All references to conjuring have been omitted, and M.D. Smith’s iconic line drawings have been replaced by 750 photographs. But the Talmudist who adds yet another layer to an onion of commentary is not the right analogy for Ben. He’s more like a Bronze-Age scribe who has reshaped the text for his own philosophical purposes. For one thing, The Experts presumes that Ben’s favored Erdnase candidate, a railroad worker named Edwin S. Andrews, wrote the original book. For another, he has reorganized the text to better reflect the overall “system” of card cheating that his mentor Ross Bertram said could be found within it. The resulting tome achieves Erdnase’s desire to “enable the skilled in deception to take a postgraduate course in the highest and most artistic branches of his vocation.” While it may seem strange to begin the technical sections with the riffle cull, for example, Ben and his long-dead coauthor realize that this is a place to begin if they assume that their reader is already an accomplished sleight-of-hand student, especially one who is familiar with the primary document. As Erdnase puts it in his opening section, “If requested to determine from what single artifice the greatest advantage is derived we would unhesitatingly decide in favor of bottom dealing … [but] it will be seen that proficiency in one artifice does not finish the education of the professional card player, and almost every ruse in the game is more or less dependent upon another one.” Ben’s rearrangement causes the entries to lead naturally into one another, from locating cards and controlling them to the bottom, to circumventing the cut and, finally, dealing them from the cellar. How effective are Ben’s rearrangements, redactions, and expansions? Well, just consider one more example. Erdnase explains a One-Handed Fancy True Cut and a run-cut variation, relying on a single illustration by Smith to convey the actions. Using almost exactly the same text, however, Ben and Andrews describe four fancy cuts and illustrate the moves using 27 photographs. No detail is left to the imagination. The Experts at the Card Table isn’t as blasphemous as it first seems. Indeed, even a serious Erdnase scholar might occasionally have trouble discerning where Erdnase ends and Ben begins. And by the time the reader turns the final page, the only conclusion is that this book is the work of a sincere student of Erdnase and one of the finest sleight-of-hand artists alive. Best of all, Ben and Andrews leave the reader wanting more. All the student has to do is reread and wait patiently for the release of the next two volumes in David Ben’s Erdnase trilogy.